There is a "tsunami" of evidence against Captain Francesco Schettino, who was at the helm of the Costa Concordia cruise ship when it hit rocks in a disaster that killed 32 people, prosecutors said yesterday. The capsizing of the Concordia in January 2012 was a tragedy on a "Titanic scale" and needed to be punished accordingly, prosecutors said, as they called for the liner's former commander to be sent to prison for 26 years. He is accused of bungling a sail-past of the island of Giglio, taking the 950ft ship far too close to the island's rocky shore in an attempt to impress members of the crew and provide a spectacle for passengers. "There is a tsunami of evidence against Francesco Schettino ,but he has admitted to nothing," Stefano Pizza, a prosecutor, told the court in Grosseto, Tuscany, where the trial began in July 2013. "It was a Titanic affair that merits adequate punishment." 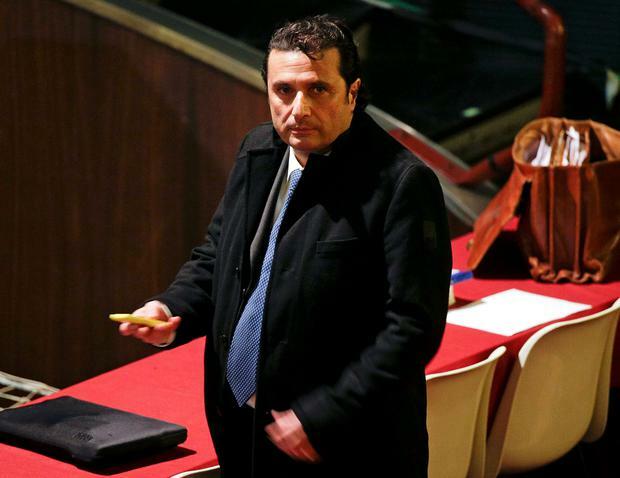 Calling the captain's conduct during the disaster "reprehensible", the prosecutor added: "It would be easier for a lawyer to fly than to defend Schettino." The prosecution rejected the argument of Captain Schettino's lawyers that he had been made a scapegoat unfairly and that the other officers who were on the bridge on the night of the collision should have been tried alongside him. "It takes nerve to continue to insist that the fault lies with others," Mr Pizza said, addressing the panel of three judges who are presiding over the trial. "We ask you, the judges, that he should receive the right punishment, a punishment that will re-establish the truth of what happened to the Concordia." The commander had tried to evade blame and "dump his responsibilities" on others, the prosecutor said.